Looking for a new family game? 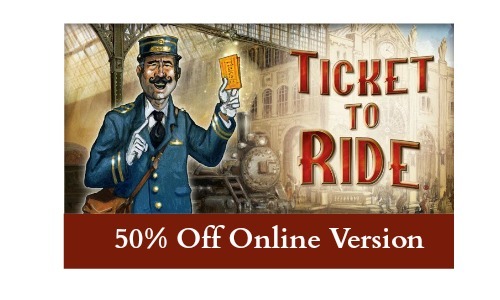 You can get the online version of Ticket to Ride for 50% off! iTunes is selling it for $2.99! You can buy it from Google Play for $2.99 as well. You can also buy the PC version for $4.99 on Steam. You can also get the complete pack: Ticket to Ride, Ticket to Ride Europe DLC, Ticket to Ride Legendary Asia DLC, Ticket to Ride Switzerland DLC, Ticket to Ride USA 1910 DLC for $14.99. Never heard of this game? Ticket to Ride is a cross-country train adventure in which players collect and play matching train cards to claim railway routes connecting cities throughout North America. The longer the routes, the more points they earn. Additional points come to those who can fulfill their Destination Tickets by connecting two distant cities, and to the player who builds the longest continuous railway. You can read more about it here.